The idea for The Bridge began in 2010. Green School arose out of an eclectic and dynamic parent community with a diverse set of talents. They were filled with ideas and inspired by the creative community. At the time the School wasn’t equipped to deal with this wave of ideas as it was itself trying to grow. At the same time over 10,000 visitors a year were flowing through the gates of Green School interested in the progressive learning model, campus, programs and projects. What tied these people together was a genuine interest and passion in changing the narrative on education, making the world a better place as well as a desire for personal change and growth. Some were exploring new paths in their own lives and seeking to pivot in their careers. In early 2018 the stars aligned as a few creative people from Green School and the parent community saw the opportunity to create a genuine holistic and integrated learning centre for the adult community. The physical space for the coworking centre evolved from an original social enterprise project, Kembali, which was the self-funding recycling centre for the Green School community. As Kembali moved to the neighbouring iHub social innovation centre an opportunity arose for a unique space situated within the campus filled with upcycled and recycled furniture. And The Bridge was launched in August 2018. The Bridge is a community project looking to provide a platform for personal and professional change. 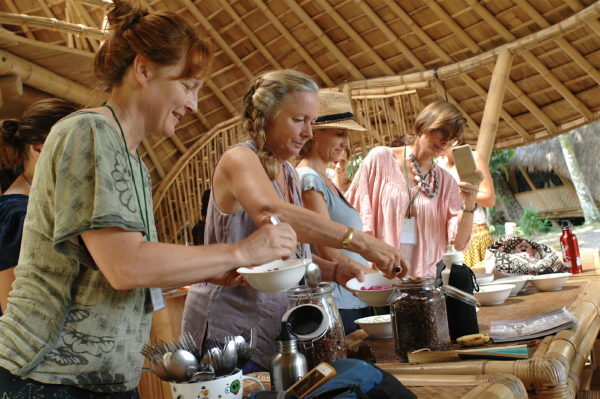 We bring together people from all over the world who want to rekindle the passion for learning and personal growth. Welcome to Green School for grownups. It’s time to be a kid again. The Bridge brings together a unique community of learners, entrepreneurs, educators, environmentalists, changemakers and influencers. A part of the community comes from the parents who have brought their children to Green School but whom also have their own intentions and plans. A part comes from the thousands of visitors and guests who grace the campus and coworking space every year. Step into a non-judgemental and collaborative space where you can explore living a different life through learning programs, networking and sharing. But while people are here for personal growth we also engage with the local community and work with some of the Green School programs like the Kul Kul Connection and Local Scholarship Program which supports over 300 local students to attend Green School full time or to get added lesson in English. Enjoy fresh, organic food brought to you by the Living Food Lab. 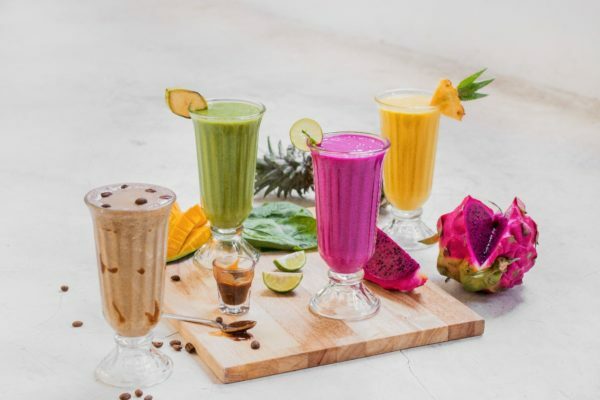 Featuring a full range of foods from breakfast to dinner you can enjoy a smoothie, sandwich, a salad buffet and locally grown, fresh-roasted coffee. Plus the cafe features sourdough bread from Starter Lab which brings their recipe and expertise all the way from San Francisco, the home of sourdough bread! All of our talks are framed around the Sustainability Compass model which provides a holistic framework to our learning. 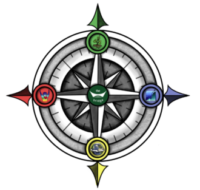 The Sustainability Compass is a tool for orienting people to sustainability. The Compass helps to bring people together around a common understanding of sustainability and a shared vision for getting there. Sometimes you need a place to meet with your team or brainstorm on an idea. 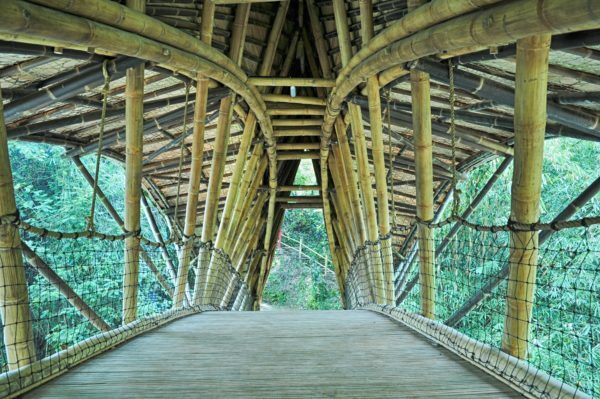 The Bridge features a 20 person bamboo conference room which can also be used at anytime by members as a free work space when not being used. Plus we have the world’s first community-built-earthen-designed skype booth. Makes videoconferencing fun again! Indonesia is an archipelago of 17,000 islands. It isn’t the easiest place to find fast internet that is reliable. The Bridge features a fiber optic fast-speed internet with the leading internet provider on the island. We also have a team of IT professionals to ensure things are always running smoothly. Well, this is Bali so maybe not “always”! The Bridge is part of a wider ecosystem of entrepreneur and innovation centres. The iHub (Innovation Hub) was established to provide a “maker space” for Green School. 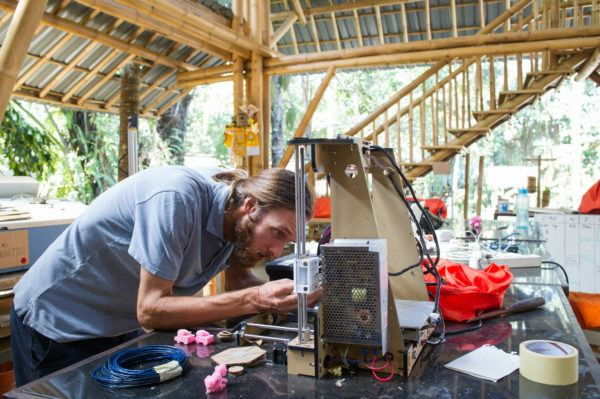 Featuring 3D printers, laser printers, woodshops, automated gardening technology and the Kembali Recycling Centre, the iHub allows students and visitors to create and build their ideas in this bamboo design studio. As part of the Green School community we follow the iRESPECT values. The acronym stands for Integrity, Responsibility, Empathy, Sustainability, Peace, Equality, Community and Trust. 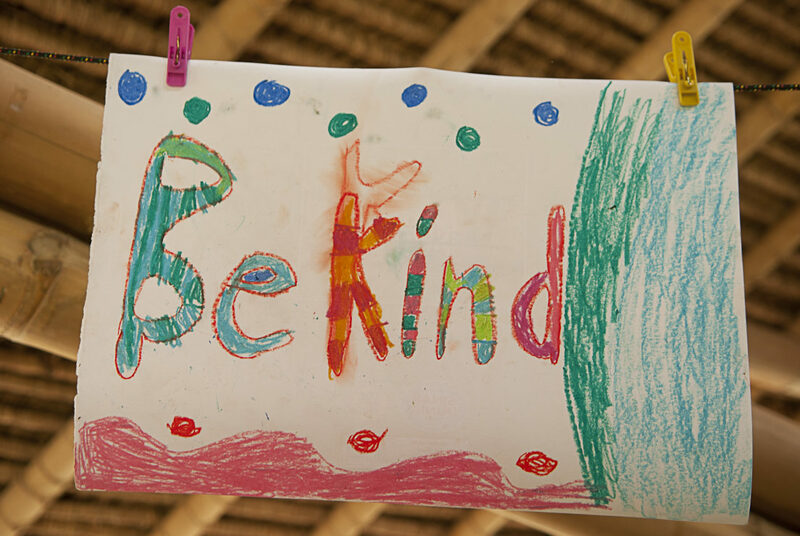 In the end the most important value is Kindness and that is a basic philosophy of The Bridge. When we are kind to each other and ourselves we can get anything accomplished. A bridge connects. It brings communities together. 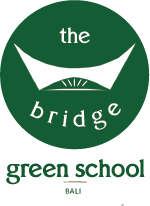 The Bridge @ Green School is a source for learning, connection and change for people looking to find or develop their passions and paths. 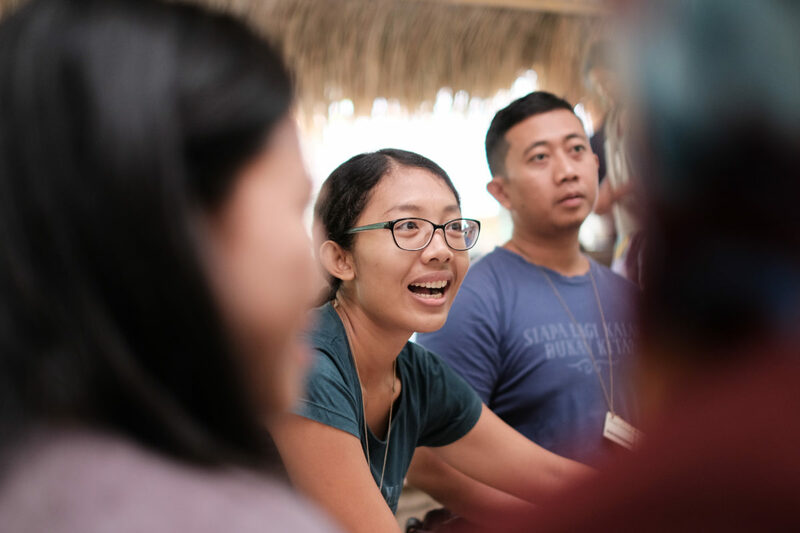 The Bridge aligns with partners who share in the mission and vision of making learning fun and providing the opportunity for people to change or enhance their personal or professional lives. We don’t just work with anyone. These are good groups with good ideas.